Apple Education Store has started a new campaign which brings $20 off on iPad’s if you pre-order one of the multipacks (10 Pack) from Apple Education Store in US. For those of you who don’t know, Apple education discount is a great way for teachers and staff of K-12 schools, and the students, lecturers and staff of college and universities to take advantage of great pricing and saving deals. 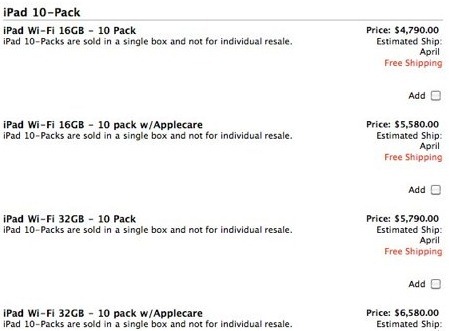 If you order one of these packs, you will save close to $20 on a single iPad in the 10-Pack bundle. Price details for Wi-Fi version of iPad 10-Pack can be seen in the image below.